Broad Appétit will be served up to the community on Broad Street between Henry and Adams Streets, which is East of Belvidere by one block. The event site lies west of the Downtown Business District and east of Belvidere St and the Virginia Commonwealth University (VCU) campus. Historic Broad St Gallery Row is easily accessible from I - 95 using the Belvidere St Exit 73. At the exit, take Belvidere St a few blocks to Marshall St or Franklin St, since you can't turn on Broad St, and head east toward Downtown. 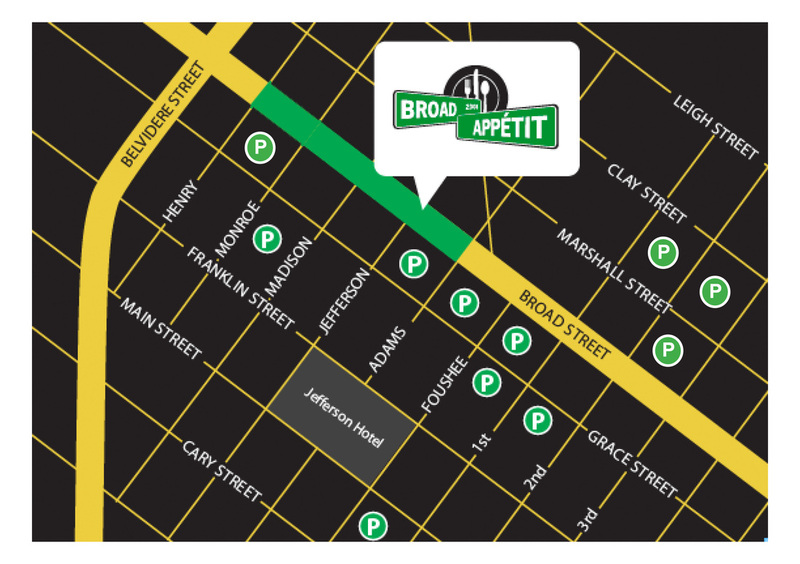 Lucky for us in RVA, you don’t have to worry about parking - connect with Broad Appetit conveniently on the GRTC Pulse! Rides are just $1.50. You can exit at the VCU & VUU stations and walk to the western entrance, or exit at the Convention Center stations and walk to the eastern entrance of Broad Appetit. The Pulse operates every 15 minutes, so you won’t have to wait long to ride. Learn more about riding the Pulse here. Off-street public parking is available at several locations on a first-come, first-serve basis, including West Broad Street Deck or the JL lot on VCU. For your convenience, there will be 2 ATM's on site. Many of Richmond's fine hotels offer free shuttle service within a 10 - mile radius.